More than a dozen military leaders say the impacts of climate change threaten military readiness and response and will increase instability and conflict around the globe. Their assessments are included in a recent report, National Security and the Accelerating Risks of Climate Change, by the CNA Corporation’s Military Advisory Board. The report’s authors – including 16 retired generals and admirals from the Army, Navy, Air Force, and Marine Corps – conclude that climate change impacts will act as threat multipliers and catalysts. Projected warming, changes in precipitation, sea level rise, and extreme weather events will pose risks to security within the U.S. and abroad. 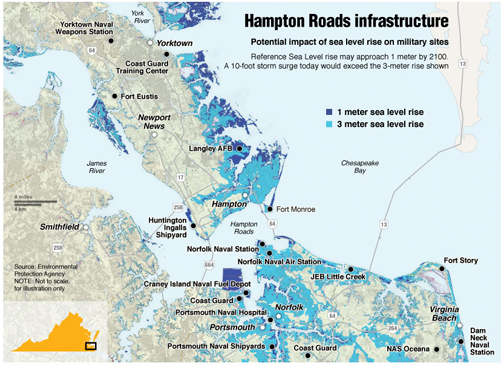 Figure 1: Sea level rise projections for the Hampton Roads region, which is home to 29 different military facilities. The CNA report also identifies the Arctic region as an area of concern for national security. As the loss of Arctic ice potentially opens new shipping routes and provides access to fisheries and energy resources, government agencies will need to update navigation charts and increase communications capabilities and disaster response preparation. 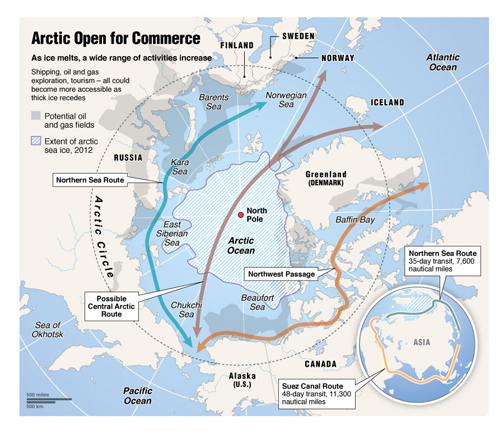 In a 2012 report, C2ES also outlined how the Arctic is a bellwether for how climate change may reshape geopolitics as countries vie for access to territory and resources. Figure 2: As Artic summer sea ice diminishes, the region offers a newly accessible abundance of resources. Drought and flooding have already contributed to conflicts in Africa, Asia and the Middle East. These types of extreme weather events have been tied to food shortages, desertification, population displacement, and mass migration, posing increasing security challenges. The Years of Living Dangerously, a documentary series airing through June 9 on Showtime, explored how years of drought may have played a role in destabilizing Syria. Explore innovative solutions, such as public-private partnerships, to build resilience in infrastructure and operations. The report should be a clarion call for the government, businesses, and individuals to step up their efforts to prepare for the impacts of climate change. Government can leverage relationships around the globe to better protect vulnerable populations where instability may grow. Government agencies can improve their coordination on assessing and managing climate risks. Businesses can contribute to the protection of infrastructure on which they rely. And individuals can work within their communities and workplaces to better prepare for climate impacts that may come our way.